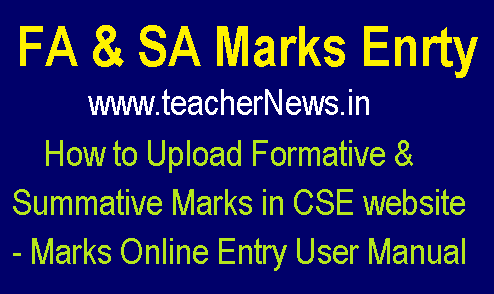 How to Upload FA 2 Marks in CSE website - Marks Online Entry User Manual : AP CCE FA SA Marks Entry Process in School Education Department official website. FA 2 Marks Upload Classes 1st Class to 10th Class link enable now. FA II Marks entry and edit services have been enabled for the academic year 2018-19. Step wise FA 1/ FA 2/ FA 3/ FA 4 and SA1/SA2 Marks Uploaded in CSE Official website Formative and Summative Assessment is explained below. AP CCE FA/SA Official Login for Marks Entry Online @ cse.ap.gov.in SCERT Instructions to School Headmasters. The link to CCE Marks entry Online is available on the website of Commissionerate of School Education Department Andhra Pradesh from the classes I to X Classes. Step 2 : Select Students Corner. Step 4 : Type Username: School DISE code & Password and type captured words and then click Submit Button. Contact Number : 040-66675282 and Cell: +917032901380. CCE FA 2 Marks Entry for Classes I to X for Academic Year 2018-19 cse.ap.gov.in cce marks entry cce marks entry proforma cse cce fa2 marks entry how to enter cce marks online sa iii marks entry cce marks entry software cce marks entry in ap. CCE FA 2 marks entry in CSE website CCE Marks Entry Proforma CSE CCE FA2 Marks Entry How To Enter Cce Marks Online FA SA Marks Entry CCE Marks Entry Software CCE Marks Entry in AP.